Compact cars and plenty of standard features don't always go hand-in-hand, but in the case of the 2017 Nissan Sentra, they do. The 2017 Sentra is not only practical, it's fuel efficient, roomy, and of good value. 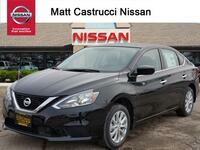 But how does it compare to other class-leading compact cars? Enter the 2017 Ford Focus. The Focus has been leading the way for many years, but it noticeably lacks the standard features current car shoppers are looking for. In fact, the base model doesn't even come equipped with cruise control, and there isn't even an extra-cost option to add the common feature to the base trim. 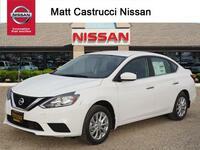 Interested in learning more about the differences between the 2017 Nissan Sentra and 2017 Ford Focus? Read on, and we'll fill you in on all of the important details! 96 cu. ft. Passenger Volume 91 cu. ft. The 2017 Ford Focus comes in ten trim levels, but it's important to keep in mind that only three underwhelming engine options are available for any of the ten trims. The 1.0-liter EcoBoost engine delivers only 123 horsepower and 125 pound-feet of torque, while the 2.0-liter Ti-VCT engine kicks out slightly more power, with a maximum output of 160 horsepower and 146 pound-feet of torque. Shoppers looking for more power under the hood will want to check out the most expensive trim in the lineup, the RS, which comes equipped with a 2.3-liter inline-4 engine that produces 350 horsepower and 350 pound-feet of torque. The 2017 Focus is also missing important standard features, such as a center armrest, power rear windows, front reading lights, illuminated entry, cruise control, and an exterior thermometer, all of which come standard on every trim level within the 2017 Sentra's lineup. The 2017 Nissan Sentra comes in eight trim levels: S, SV, SR, SR Midnight Edition, SR Turbo, SR Turbo Midnight Edition, SL, and Nismo®. Three engine options are available: the 1.8-liter DOHC 4-cylinder generates 130 horsepower and 128 pound-feet of torque, while a separate 1.8-liter 4-cylinder kicks out 124 horsepower and 125 pound-feet of torque. Looking for more power? No problem! The 2017 Sentra also has a 1.6-liter turbocharged 4-cylinder that delivers 188 horsepower and 177 pound-feet of torque. 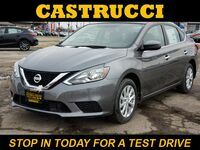 The 2017 Sentra also comes well-equipped with interior features such as Bluetooth®, a drive computer, power windows and door locks, overhead LED map lights, a 6-way adjustable driver's seat, and 60/40 split-folding rear seats. 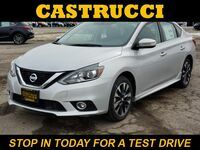 Car shoppers interested in learning more about the 2017 Nissan Sentra, or any of the Nissan models in our lineup, are encouraged to contact a member of our team here at Matt Castrucci Nissan. 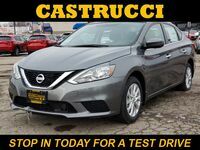 Drivers ready to see the impressive sedan up close and in person are invited to come see us at our location in Dayton or schedule an obligation-free test drive online!